We’d love your help. Let us know what’s wrong with this preview of The Art of Raising a Puppy by Monks of New Skete. To ask other readers questions about The Art of Raising a Puppy, please sign up. This was my first reading of the updated version of this book. I was first introduced to the Monks of New Skete 20 or so years ago. I had a dog at the time, but not a puppy, so I'm not sure why I read this book then (other than the fact I devoured any and all dog books as a child). And now I remember why they had such a profound impact on my relationships with dogs. Unlike the conditioning training so popular today (positive methods rely on positive and negative conditioning) the Monks of New Sket This was my first reading of the updated version of this book. Unlike the conditioning training so popular today (positive methods rely on positive and negative conditioning) the Monks of New Skete emphasize the importance of a deeper relationship with your dog. We aren't training laboratory rats, they seem to say. Treat your dog as your friend: guide him to obedience and appreciate the wonderful individual he is. Practical understanding of dogs, but with an incredible amount of love, are on every single page. This book honors dogs as DOGS: intelligent, loving, loyal creatures who decidedly are not human. The funny part about this is that I'm sure the Monks do not fit into the 'positive' camp. They will use scruffing techniques to correct misbehavior, do suggest a tug on the leash, and are starting to see (although I don't believe they use them) the value in e-collars. Yet the love they have for their dogs, and that they want us to feel for our own dogs, is incredibly deep. Far, far deeper than tricks-for-treats or redirection with treats methods that appeal to our sense of 'positive'. This book is practical, easy to understand, and well written. It isn't a cold manual for bringing up puppy, yet it explains how to raise a solid companion. It explains the importance of choosing the correct puppy and tests to determine if a puppy you are considering will fit into your lifestyle. There are interesting observations about early puppy development, and correlations drawn between dog pack and wolf pack behaviors (with an understanding that dogs and wolves are not identical animals). Special emphasis is placed on socializing your puppy young and doing early (puppy based and light) obedience work to prepare your pup for more intense training later. I especially appreciated the explanation of why my pup constantly jumps to lick company- I frankly hadn't realized how important our faces are to our dogs. 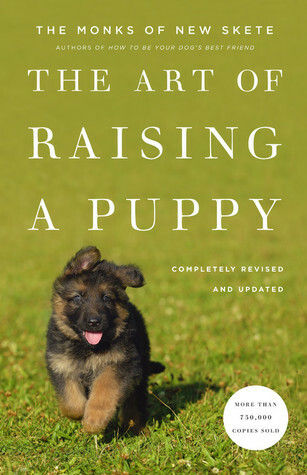 A wonderful book for talking about puppy behavior in the neonatal stages before owners generally get their pups and talking about the importance of an early upbringing. Excellent book also for some basic training information. I am wary of some of their dominance-based suggestions for training however. Some of the specific suggestions they recommend including giving breeds such as German Shepherds or Dobermans a "cuff" to the chin if they growl at guests could be dangerous. As a veterinarian we kn A wonderful book for talking about puppy behavior in the neonatal stages before owners generally get their pups and talking about the importance of an early upbringing. Excellent book also for some basic training information. I am wary of some of their dominance-based suggestions for training however. Some of the specific suggestions they recommend including giving breeds such as German Shepherds or Dobermans a "cuff" to the chin if they growl at guests could be dangerous. As a veterinarian we know that this kind of punishment and violent behavior can sometimes just teach dogs to hide early signs of aggression without actually decreasing their propensity to bite. It can turn off important early warning signs for people. Additionally it is difficult for owners to learn from the book how heavy handed to be when using some of these dominance techniques. Having seen owner's interpretations of these suggestions first hand I see that it often results in owners channeling their frustration into training that is harmful to their dog and hurts the human-dog bond. For example, dog mothers do not correct their puppies by saying, "Now Spot, that was not a nice thing to do. I don't like it when you do that so you'll have to stop that, you hear?" This is something I've seen done way too often between human owners and their dogs. Usually the offending pup (if after several warnings hasn't stopped the offending behavior) will get a snarl, grabbed by the scruff of the neck, and shaken rather firmly. Or it'll get pinned to the ground so that it understands where it stands in rank. Though some of the methods may seem harsh by human standards, one must remember that these are DOGS and should not be placed at the communication or language level of HUMANS. Great read overall and very conversational style. Well done. I bought a dog! And everyone says this is THE book! And I bought a dog! And it's true this book is really great! And I bought a dog! So when I bring little Archy home from the breeder at I bought a dog! And everyone says this is THE book! And I bought a dog! And it's true this book is really great! And I bought a dog! So when I bring little Archy home from the breeder at the beginning of June, I'll be all ready with the dog whispering. It's gonna be awesome. I really liked this book. Even if you're not super into the Monks' training methods, there is SO much good information to glean from this about the stages of puppy development, the importance of starting out with a good foundational relationship with your pup to head off behavioral problems down the line, etc. I really like the emphasis on the fact that even when you're not actively training your dog, you're teaching him/her all the time, so you had better make sure you're teaching and encouragi I really liked this book. Even if you're not super into the Monks' training methods, there is SO much good information to glean from this about the stages of puppy development, the importance of starting out with a good foundational relationship with your pup to head off behavioral problems down the line, etc. I really like the emphasis on the fact that even when you're not actively training your dog, you're teaching him/her all the time, so you had better make sure you're teaching and encouraging the behaviors you want to see bloom rather than the ones that will make things much, much harder down the road. The last section of the book, which features an interview with Maurice Sendak about his dog Runche, is something of a joy. I wish I had the book in front of me, but Sendak talks at length about how working with dogs and learning to treat them with dignity and consistency and treat them as partners and as DOGS (rather than as people who can carry his baggage) has made him a better human being. I think that section alone is worth getting the book from your local library or borrowing it from a friend. While I am okay with anecdotal evidence when training dogs, i found this book difficult to apply to what i need to do with my pup. My biggest pet peeve is doing an alpha roll on a puppy. Sure the dog may respect you, but it will be out of fear and resentment. Okay, if you're going to get a puppy---get this book first. Don't bother to read it from cover to cover but jump around. Of course, it does help to actually have read the whole book, but the order isn't important. Whether you begin with the case studies or open the book at the page where they give a house-training schedule (p. 117)---it doesn't matter. It's all good stuff. The Monks breed and raise German Shepherds (for companion dogs) and have spent a lot of time observing dogs and raising puppi Okay, if you're going to get a puppy---get this book first. Don't bother to read it from cover to cover but jump around. Of course, it does help to actually have read the whole book, but the order isn't important. Whether you begin with the case studies or open the book at the page where they give a house-training schedule (p. 117)---it doesn't matter. It's all good stuff. I have very mixed feelings about this book. After being initially enthralled with the Monks approach, I started to think they were not as sweet-natured, Zen-like in their approach as I had hoped. They are more heavy-handed in their approach, with emphasis on choke collars, and Alpha dominance. However, I did find some of their advice quite helpful, including the idea of using confinement and crate training for puppies, and their house-training schedule using the crate, being taken out, eating an I have very mixed feelings about this book. After being initially enthralled with the Monks approach, I started to think they were not as sweet-natured, Zen-like in their approach as I had hoped. They are more heavy-handed in their approach, with emphasis on choke collars, and Alpha dominance. However, I did find some of their advice quite helpful, including the idea of using confinement and crate training for puppies, and their house-training schedule using the crate, being taken out, eating and play. It was a helpful, initial, starting point, but I soon decided that I preferred to modify much of their approach with more of the "positive-reinforcement" training methods. This is a thorough book about puppy growth. I enjoyed reading before we got the puppy. But trying to read it during the puppy raising was too much. I would be reading about different stages than the puppy was actually in. I did not grasp the training system. We have since switched to a more praise based training. I like these Monks and their philosophy. This pup of ours is proving to be a loving, adorable, challenge. I'm not sure everything in this book will work for him, but we're going to give it our best shot. Read this before I knew better, meaning before I knew about positive reinforcement. For its time this was an okay book but even the monks realized it needed to updated. My new baby Harriet will be coming home from the breeder in two weeks. As a result, I’m reading five books on positive reinforcement-based puppy training and comparing them for anyone trying to decide which of the most popular puppy books to read. Links are below. The most wordy of the five pu My new baby Harriet will be coming home from the breeder in two weeks. As a result, I’m reading five books on positive reinforcement-based puppy training and comparing them for anyone trying to decide which of the most popular puppy books to read. Links are below. The most wordy of the five puppy books. There’s a lot of waxing poetic about the relationship between man and animal, and at times it downright channels Aristotelian philosophy (“We can never understand fully why a dog is the way it is. In fact, ‘the dog’ does not exist, only individual dogs and the unique way each develops”). Very thoughtful, very appealing philosophy to dog-raising. Really values each puppy’s uniqueness. There is a short chapter on “dominance” which I don’t believe it, but it’s brief, gentle, and a minor part of the monks’ overall philosophy on dog training. One of my favourites of the five books, but probably only best for active readers. The other books are tailored more for the casual reader of self-help books who doesn’t otherwise spend a lot of time reading (especially the Zak George and the Shirlee Kalstone book). This one is a little more dense and explanation-heavy (“‘Obedience’ comes from the Latin word ‘oboedire,’ which in turn is cognate to ‘ob-audire,’ meaning ‘to listen, to hear’” is a quote from this book; compare that to Zak George’s “Your puppy is like a curious toddler—she’s going to want to explore everything in her new home”). Both this book and Zak George’s are great, the best of the five I read, but totally different audiences. Recommends it for: Dog Lovers, German Shepherd owners, and anyone geting a puppy. This is a must read book if you want to understand your puppy and grown dog which makes it easier to choose and train a puppy. Most info is regarding German Shepherds. It was very informative and has helped me train my German Shepherd. I highly recommend this book. this is invaluable for new dog owners and I learned so much, but advice is very traditional and not all of it will be suitable for all families. I liked that this book helped me get into the mind of my puppy before I took him home, in terms of socialization and clear cut rules. This isn't a step by step guide though. This book has some good information, and I appreciated a lot of the early stages puppy information, but I’m not a big fan of the harsher correction methods they advocate. Leash popping and the like are far harsher methods than needed, especially on young, developing puppies. First time raising a pupp? cheers! THIS IS NOT THE BOOK FOR YOU. it does provide good information about the development stages of dogs, but all things here about actually raising a puppy are just old-fashioned, there are a lot of great books (listed below) that teach POSITIVE TRAINING, a method that has proved to be much more succesful, fun, and effective. In the begging of my procces with training my precious little Zoe, this seemed like the go-to-book, better then any article online. HOWEVER, as First time raising a pupp? cheers! THIS IS NOT THE BOOK FOR YOU. it does provide good information about the development stages of dogs, but all things here about actually raising a puppy are just old-fashioned, there are a lot of great books (listed below) that teach POSITIVE TRAINING, a method that has proved to be much more succesful, fun, and effective. HOWEVER, as much as the first chapters are fascinating, a lot of stuff here is just plain stupid and often misleading for new dog owners. For example, the chapter on crate training tells you to keep the dog in there for about 15 minutes, even if it cries. For me, this has ruined crate training as my Zoe just wouldnt stay there no matter how many treats I gave her later on. Another one is the chapter where they suggest you should firmly grip the dog's muzzle to show you're the boss. not to mention the Alpha roll exercise that was ommited from newer version but just goes to show how inaffective and old-fashioned their methods are. 1. The Other End of the Leash: Why We Do What We Do Around Dogs - McConnell, Patricia B. This book does a great job of exposing you to all aspects of puppyhood - from finding a good breeder to all of the training that needs to take place. The book offers a lot of good stories that resonate with the reader as well as quite a few tips of how to introduce your puppy to basic commands. It provides a nice list of exercises throughout that you can do with your puppy to build up trust and ensure you and your puppy are safe. Unfortunately, while the book offers a lot of great advice througho This book does a great job of exposing you to all aspects of puppyhood - from finding a good breeder to all of the training that needs to take place. The book offers a lot of good stories that resonate with the reader as well as quite a few tips of how to introduce your puppy to basic commands. It provides a nice list of exercises throughout that you can do with your puppy to build up trust and ensure you and your puppy are safe. Overall I think the book is a good read for people wanting to learn how to pick a puppy and for people who want to learn basic training tips. However, if you're wanting more of a clear idea of what all you should be doing once you get a puppy (beyond the few training sessions a day) I'd recommend looking elsewhere. That being said - I do plan on going back to this book in the future to read some of their suggested exercises and details. After I got over the fact that this book wouldn't teach my dog to read, I really enjoyed it. The first half of the book is all about how a puppy is born and develops. There were several 'aha' moments as I read about each stage. Since I do not know anything about the first several months of my puppy's beginnings, it helped me to understand why Clementine has some of the socialization issues she has. It really isn't her fault. The last half of the book gave some great ways to train my dog, and mor After I got over the fact that this book wouldn't teach my dog to read, I really enjoyed it. The first half of the book is all about how a puppy is born and develops. There were several 'aha' moments as I read about each stage. Since I do not know anything about the first several months of my puppy's beginnings, it helped me to understand why Clementine has some of the socialization issues she has. It really isn't her fault. The last half of the book gave some great ways to train my dog, and more importantly, how to correct some bad behaviors. They are already working! So we got a beagle puppy and we named her Olive but right now the name Spaz' seems more fitting. This book was recommended to me and although some parts were really great and helpful i don't think the average dog owner could use the same techniques given here. This books also points to the importance of knowing the breeder of the dog and why rescuing a dog isn't a good idea- which i can understand- and Olive is proof why this isn't a good idea- but i also just don't agree with promoting that mes So we got a beagle puppy and we named her Olive but right now the name Spaz' seems more fitting. This book was recommended to me and although some parts were really great and helpful i don't think the average dog owner could use the same techniques given here. This books also points to the importance of knowing the breeder of the dog and why rescuing a dog isn't a good idea- which i can understand- and Olive is proof why this isn't a good idea- but i also just don't agree with promoting that message. Overall a descent book in theory, but the practicality of what they want the owner to do just seemed a little far fetched.